This article will go over how to to set up your Online Ordering Settings for your customers to go online and place orders. This will include restaurant name/ location, order types you accept, customer online ordering settings and tips (gratuities). 2 - Once you click on your location you will then look for the Online Ordering Settings link. 3 - Once you click on Online Ordering Settings and new box will appear with Online Ordering Settings information. 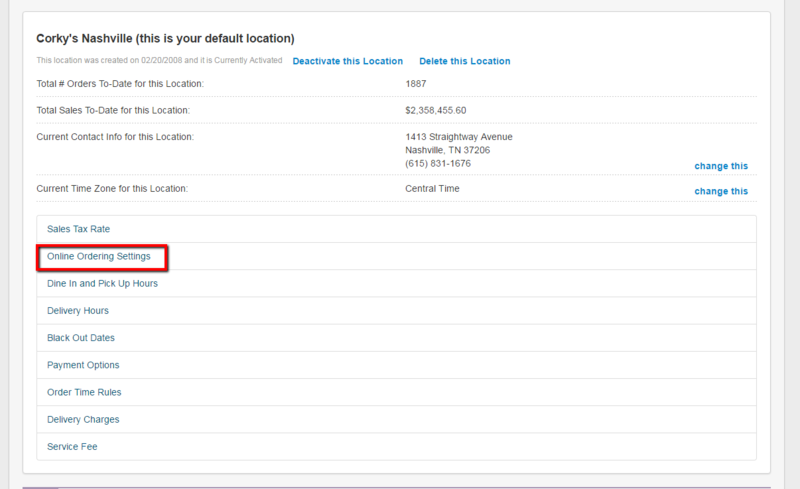 A - Here is where you type in your Restaurant's Name or add a specific location under the Location Name box. B - Here is where you check off the base type of Orders that you will accept. To add customer order types please see the customer order type article. C - If you don't want employees to be able to access CaterZen check off the Disable for Everyone. D - If you ONLY want employees to be able to access CaterZen and NOT customers check the Disable for Public checked off. E - By default we will have checked off Send All Order Immediately Upon Receipt. If you decide you do not want this (which we DO NOT recommend) you can un-check this box. F - If you want the customer to be able to add a tip at the end of the order and for the tip box to appear on the Order Entry screen, then check off Allow Tips to be added to Orders at Checkout. You have now customized your Online Ordering Settings.